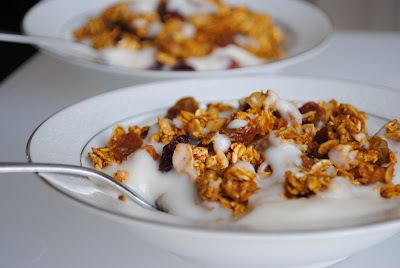 A healthy snack that tastes great on its own or mixed with yogurt. Make sure you use pumpkin puree not pumpkin pie filling. This is also a recipe where it works best to use quality maple syrup. Pancake syrup will work but it won't give it a true maple flavor, it just adds sweetness. Spring for the good stuff if you can. 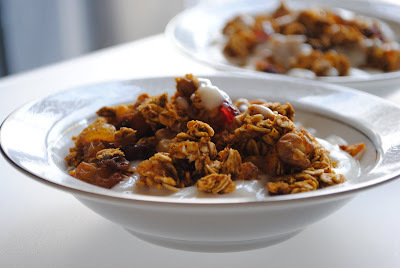 If you prefer raisins to cranberries, increase one and decrease the other. Same for the nuts, use pecans instead of walnuts or leave them out altogether. The great thing about this recipe is how easy it is to substitute what you like to tailor the recipe to your specifications. Preheat oven to 300 degrees. Line a large baking sheet with a Silpat or parchment paper. Combine all ingredients in a large bowl and mix well until the wet ingredients are evenly incorporated. Spread out mix onto a baking sheet, try to get it into an even layer but don't worry too much about clumps at this point. Bake about 30 minutes, stir and spread mixture in an even layer again. Continue baking about 30 minutes more. Let cool completely and store in an airtight container. looks delicious! your photos are beautiful! 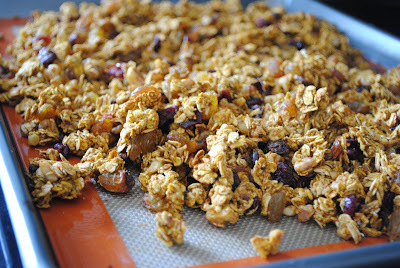 I just started making my own granola. I love the flavor cobinations in this one. I will have to try these! Do you use fresh ginger or ground?